Maria Casino is operated by Unibet (International) LTD, running under UK and Maltese online gambling licenses. The destination was established in 2007, however in 2016 they introduced a fully revamped website which is a gamechanger considering their online casino service. The site provides a smooth, fully customizable experience for their players and also offers a huge selection of online casino gambling content. The dark and cozy atmosphere of the site is interesting at first, presentation is fascinating, but it doesn’t matter, since after a few second you will be engaged with the cool features and the easy-to-use interface anyways. Maria Casino offers more than 500 online casino games including live casino games, live dealer blackjack, video slots, classic slots, jackpot games, table and card games, scratch cards and even lottery from the most recognized online gambling content providers like NetEnt, Microgaming, Playtech, IGT or Williams Interactive. This massive catalogue is divided into different sections, but you can alter everything once having signed up. You can set your ‘Preferences’, ‘drag and drop’ stuff into ‘My Games’ and you can also ‘Like’ and ‘Favourite’ the content. By this, you can set up an online casino environment that is a perfect fit to your needs. Moreover, you can refine your gameplay strategy easily using the performance analysis that presents your gaming statistics in graphs. Gaming data like ‘winnings vs stakes’, ‘bet vs win’ and ‘bet to win’ can be displayed with a few clicks. Maria Casino is available in seven languages as it serves Danish, Dutch, Estonian, Finnish, Norwegian and Swedish speakers besides English. Banking methods are somewhat limited, but Maria Casino offers a great customer support via live chat, phone and email. You can choose from three different welcome bonus offers. The 100% max. £200 first deposit bonus is designed for high rollers, but you can go with 150% max. £60 or a 200% max. £20 match bonus on your first deposit either. 40 free spins are also provided on your first deposit, 10 in each of the first four days after registering. Maria Casino offers the best gaming content from a wide selection of online gambling suppliers like NetEnt, Microgaming, Playtech, IGT, Williams Interactive, Jadestone, GTS, Play’n Go, Relax Gaming, AG Software, NYX, Thunderkick or Yggdrasil. Maria Casino is very strong in online blackjack as they offer as many as 21 different titles. From Classic 5 Hand Blackjack or High Streak Blackjack to Vegas Single Deck and Premier Blackjack Hilo, several different types of single and multihand blackjack games are available in the catalogue of Maria Casino. The destination also offers live dealer blackjack. 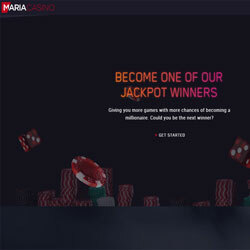 Players can choose from over 500 games at Maria Casino. The property has a vast selection of online slots, including the latest video slots as well as traditional slot games, casino games including table games and card games. Even scratch cards and lottery is available at Maria Casino that also has an online bingo section. These games are displayed in different sections, making them easy to browse and the possibility of customization takes the experience to a different level. Maria Casino Maria Casino is not that strong in bonuses, however the flexibility of the first deposit bonus is definitely a plus and the 40 free spins divided to the first four days after registering is also a booster. Several daily promotions are available however to spice up the midweek casino gaming experience as well as weekend wagering and online casino tournaments also run regularly on the site. Maria Casino is a great fit for both newcomers and experienced online casino players. The service is seamless on any platform, gaming content is enormous and the customization opportunities make the destination a perfect choice if you are looking for a modern and customer-focused online casino. 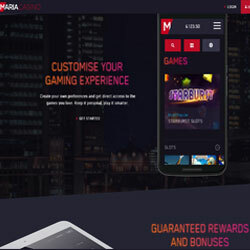 The new website of Maria Casino delivers the full package on mobile devices. Thanks to the new, fully responsive and advanced design, Maria Casino provides a smooth and extremely modern mobile casino gaming experience. Maria Casino Maria Casino offers live dealer games. Table games like Roulette and Baccarat as well as card games like Blackjack and three different kinds of poker are all available as live casino games. Telephone open: 08081686638 (UK) ( Monday to Friday, 7am – 1am. Saturday and Sunday 7am – 11pm ) .